Happy New Year, people! I hope you’re all looking forward to the year ahead as much as I am. Sorry I’m a day late, but I spent yesterday sleeping off the night before. It was a heavy one. Like you’ve never fallen asleep with your head in a bowl. Have you made any resolutions? I haven’t, because I know I won’t stick to them. 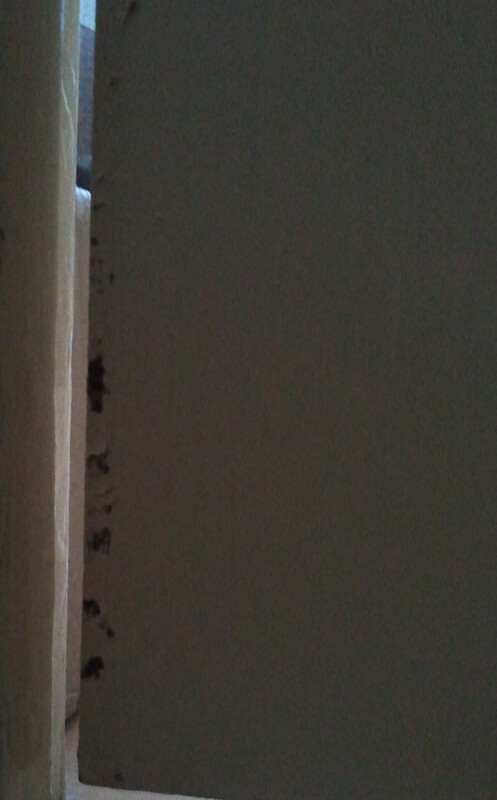 Like, last year my resolution was to not chew anything I didn’t have permission to wreck, but within hours nature had taken over and there were bunny bite marks all over the place. Fish gotta swim, footballers gotta spit and swear, bunnies gotta nibble. That’s life, folks. As much as it pains me to say it, I think she sort of makes sense. 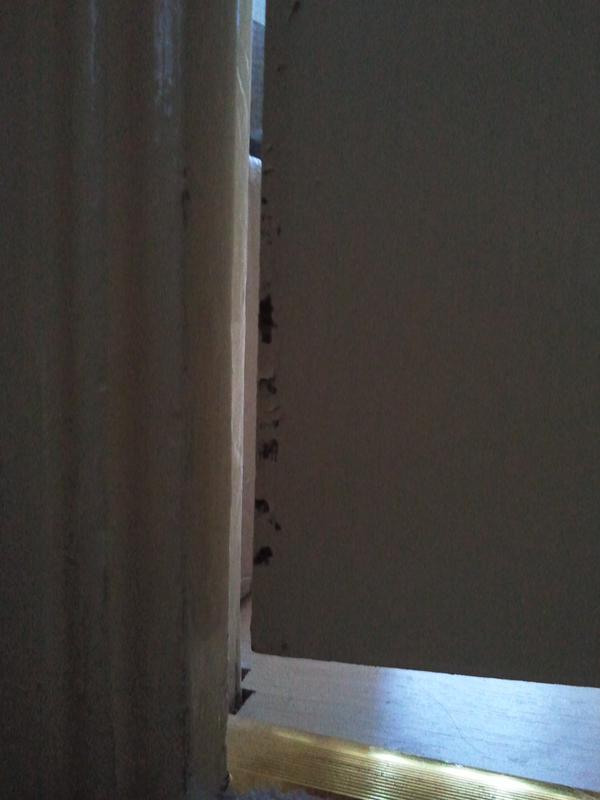 So, with that said, my first goal of 2013 is to find an alternative route under the bed. What are your goals and resolutions? It’s Wednesday, and I know what that means. Abandonment. That’s what. Mummy El’s started this thing called Pilates; she has to go out to do it, so I’m not really sure what it entails, but I do know that the first time she did it she ended up doing further damage to her already dubious back and spent all weekend in bed. In fact, I don’t think I even want to know what it is – it must be bad! Anyway, she braved it and went again the week after and took Mummy J with her. She either didn’t want to suffer alone or it’s fantastic exercise and amazing for toning your abs, depending on whether she was talking about Mummy J or to Mummy J. Mummy El wasn’t too bad after her second go, and Mummy J didn’t have to take to her bed, but she did have a bit of a groan when she sneezed or coughed. Yep, they can definitely leave me out of it, whatever it might be. Last week, they went again! That’s when I noticed a pattern forming. It’s ritual abandonment. Last week took the mick though; they left at 7 and didn’t get home until 10:30! 10:30! They didn’t phone, didn’t text, nothing. Just left me shut in the living room with stinky Frodo and Billy the Puffer Fish. 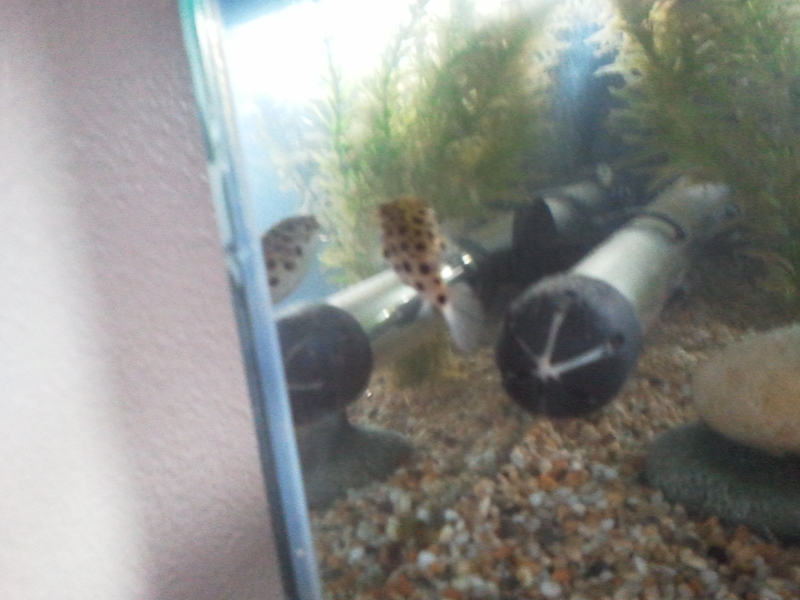 Have I mentioned that I’ve got a pet Puffer Fish? I don’t think I have. There’s not much to tell, really, although we do have a lot in common. We both live alone, we’re both very intelligent, we both have a good sense of humour and we both have large, sharp front teeth. Billy, not posing for his picture again. He’s camera shy. Anyway, getting back to my situation; apparently, with my gift for eating the mouldings and taking a disliking to the occasional carpet, when they leave the house and I’m not in my hutch I get shut in the living room, as was the case last Wednesday. Now, they don’t have much of a social life so only tend to nip out for an hour here or half an hour there, which is acceptable, but 3 and a half hours?! I ask you! In fact, someone phone the RSPCA. The worst of it: they didn’t leave me a light on! Allegedly, they intended to be back at 8:45, straight after Pilates, well before it gets dark, but on the spur of the moment decided to go to the 24 hour supermarket with the big green letters, since they were in the area. That’s their story, and they’re sticking to it. Did they buy me anything to let me know they were thinking of me, or to compensate me for my woes? No. Well, I let them know exactly what I thought of them when they got in. I ignored them, wouldn’t let them cuddle me and stood outside the closed bedroom door, demanding that they open it and let me go to bed at once. 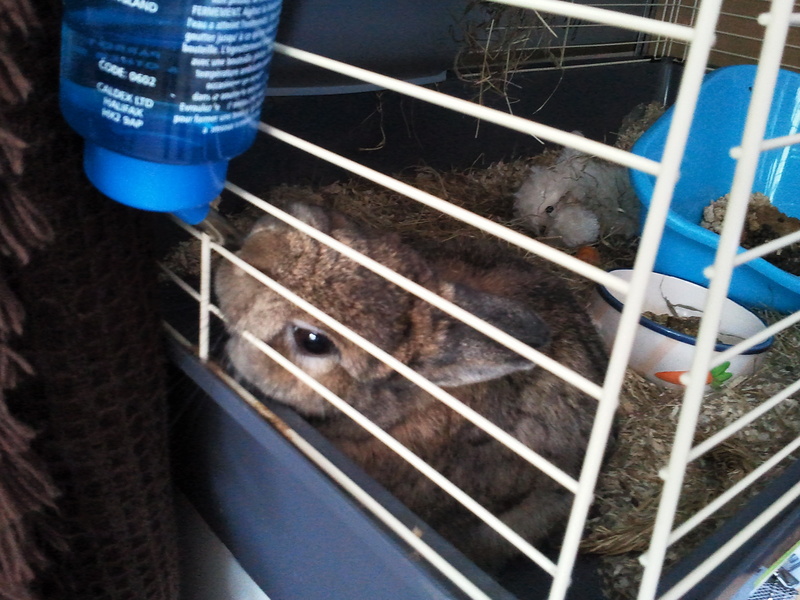 Then I had a good old-fashioned sulk in my hutch and watched Big Brother. Don’t judge me, it’s good TV. Anyway, I’ve got it sussed now and I’m prepared to spend tonight sad and alone. They’ve promised they won’t leave me for any longer than they have to and that I won’t be sat in the dark this time, but I’m not sure how much I trust them. Please can somebody send them a gentle reminder that they’ve got a furry little boy waiting for them at home? Okay, firstly, I have to apologise for my blog yesterday. 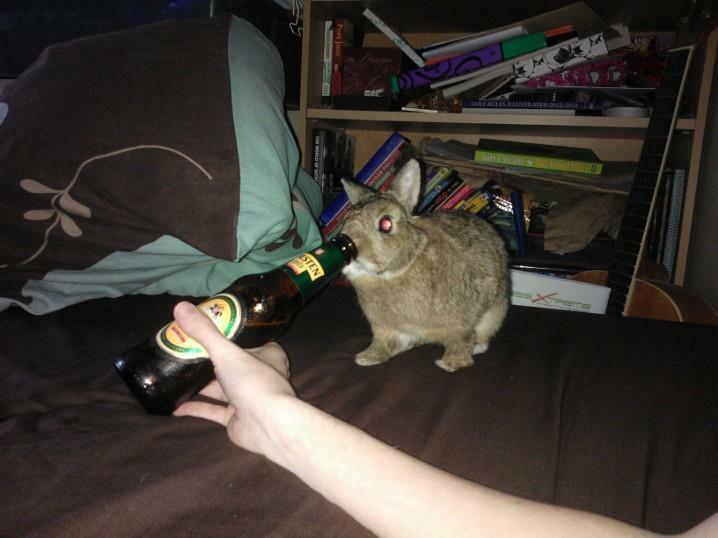 Mummy El and Mummy J were both quite upset when they read it, and said it was unbalanced as I neglected to mention that I was allowed to try their crisps and have a beer with them during the Euros, which most bunnies aren’t allowed to do. They quite rightly said that they didn’t bring me up to be mean and ungrateful which I apparently was in spades yesterday, so sorry Mummies, and sorry readers, I was just having a bad day and feeling a bit emotional – I think the whole waiting for a puppy ordeal is getting to me a bit more than I would have liked to admit. 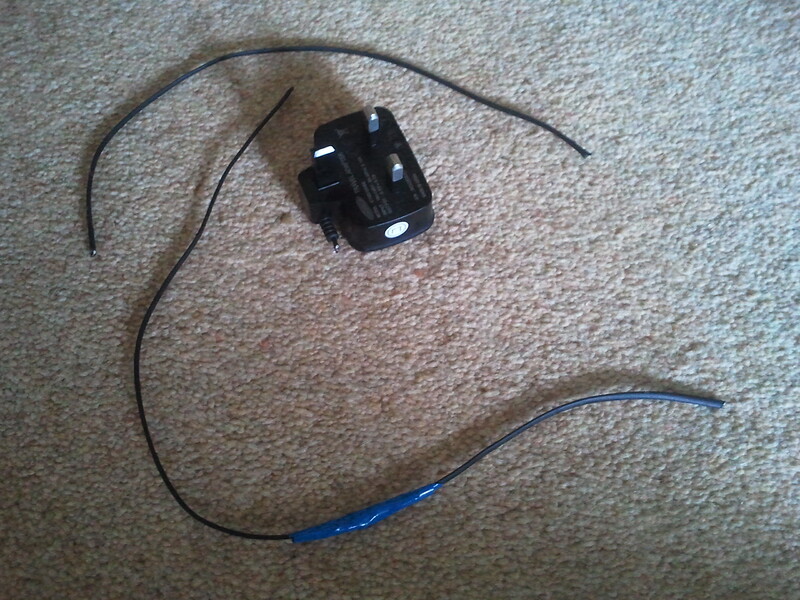 So, anyway, one of the (allegedly, many) disparaging remarks I made in yesterday’s post was about my educational toy, but in fact, it has taught me a valuable skill which I was able to implement for the first time today! Yay! I managed to open the bi-folding bedroom door all on my own! Geordi tried and tried to show me how to do it but being a dog and having a muzzle it was easy for him; he just wedged his nose into the gap and flicked his head to the right and, voila, it was open. If there wasn’t a big enough gap he knocked the centre fold where the hinges were with his paw and created the gap, and the job was a good’un. I don’t have a muzzle. It’s been argued that I don’t even have a nose to speak of. Someone once said that I looked as if I’d run head-first into the patio door, which was hurtful but, on some level, true. I do have a bit of a flat face. Geordi’s technique is just not practical or doable for me, so I’ve had to develop my own. I think I’ve spoken before about my attempts to open the door, which has resulted in some chipped paintwork and quite a bit of shouting, but today the fruits of my labour were there for all to see! An open door, and a rabbit under the bed! Success! I realised early on that chewing my way through would be a lengthy process, not least because it rattles a lot when I’m having a nibble so someone always comes running out to tell me off, hence my having to find another way. So, back to my educational toy: stage 3 sees 4 individual lids placed randomly over the treat-containing recesses, but instead of just picking the lids up and chucking them off like in stage 2, they’ve been slid in on tracks, so I have to manoeuvre them in a particular way, following their line of movement rather than using my old faithful smash-and-grab tactic. As we all know by now, nothing gets past me and I worked it out quicker than Mummy El worked out how to put it together, but then the cogs started turning… From what Geordi showed me, the same principle must apply to the bi-folding door; sliding it along in a fixed direction. This morning I got the chance to try it out. Now, I’m still muzzle-less so there still had to be a bit of involvement from my teeth, but I sank them in, pushed the door to the right, and hey-presto, I was in! What are they going to do to keep me out now? I feel some more antics coming on! I’m happy to admit it when I’m in the wrong. I think. In theory. I’ve never been in the wrong yet, but I’m confident that I’d hold my paws up to it. The thing is, according to Mummy El, I’ve been a very naughty boy. Again. I’d better make my business work because my debts are starting to mount up. Again. Apparently, there are rules and I broke all but one of them yesterday, but I think they’re following the wrong rules. The way I see it, there are stupid, irrational, ever-changing house rules – their rules, and then there are the much more sensible and constant rules of nature – my rules. According to Mummy El the rules I broke yesterday were: no chewing cables, no tearing up boxes, no biting Mummy’s clothes (particularly since Mummy was in them), no getting on the Xbox, no diving under beds, no trying to open doors with my mouth, and no aggressive behaviour. See what I mean about being stupid and irrational? I’m a rabbit, so I chew. Whether it be grass, hay, cables, boxes or the ankles of Mummy’s trousers (it doesn’t matter if Mummy’s ankles happen to be in them), I chew. You know when you’ve been Tino-ed. If there is a shelf which is tantalisingly higher than the one I normally sit on I will attempt, and eventually succeed in, getting on it. Please note: I am indiscriminate about whether there is a bamboo bunny mat or a games console sitting on said shelf. A shelf, is a shelf, is a shelf. Rabbits like burrows. To domesticated boys like me, beds = burrows. I’m bright and curious, which normally I’m praised for. Don’t be surprised or cross when my curiosity wants to lead me behind a closed door. And finally, if you break my rules, I get just as cross as you. Am I really such a bad boy? What’s your verdict? I’m officially a genius. I’ve come up with a way to pay off my debt and chip in for my new puppy – I’m going to become a self-employed shredder. I’m fast, efficient, and best of all, I’m environmentally friendly! It didn’t really occur to me at first that I could turn my hobby into a career, but I suppose that’s what Mummy El did with her Personal Training, and it makes perfect sense. I’m passionate about what I do, which means I make a much better job of it, and I’d be doing it anyway so I may as well get paid. I was born for this job. I’ve been honing my skills since birth; I wasn’t that great at it at first, and had a few mishaps with things getting away from me, but practice makes perfect, and now I’m a pro. 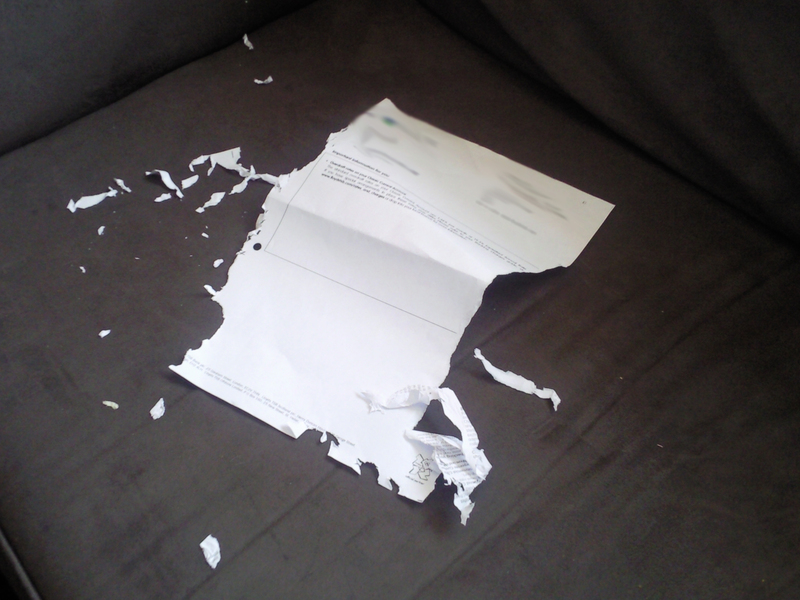 I got the idea to turn it into a business when Mummy El left a bank statement on the sofa, and me unsupervised. I thought there was a 99% chance that there would be a bit of yelling, tutting and blaspheming as there normally is when I’ve got my teeth into something, but quite frankly, I don’t care. It goes in one ear and out of the other; they’d never lay a finger on me so I don’t have to worry about getting smacked, and the worst punishment I’ve ever had was to be put back in my hutch, where there’s food, water, and my cuddly friend, Moo Moo. They really have no clue when it comes to consequences and discipline. So, with this in mind, I got nibbling. I was interrupted half way through when Mummy El came in; I looked up and pulled my innocent face, but I knew it was no good and that I’d been caught in the act, so I prepared myself for the yelling and got ready to bolt. To my amazement, the yelling didn’t come. Instead she laughed! She also admitted that it was her own fault for leaving it there, and I can’t disagree, and then said in a very flippant way that I’d make a good shredder. Well, that was it. The seed had been sown. I’m not taking this lightly, I’m going to make sure that I’m fully prepared to take on the responsibility of this role – I don’t want to embarrass myself or let any of my customers down, so I’ve been trying my hand (well, paws and teeth) at getting through different materials. 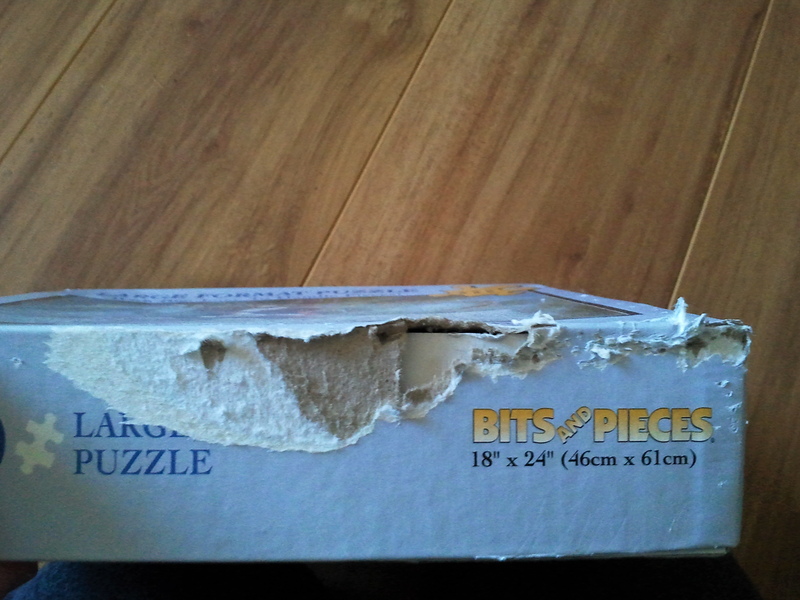 The tissue box was easy, although there were many, many interruptions whilst I was trying to get through this one. 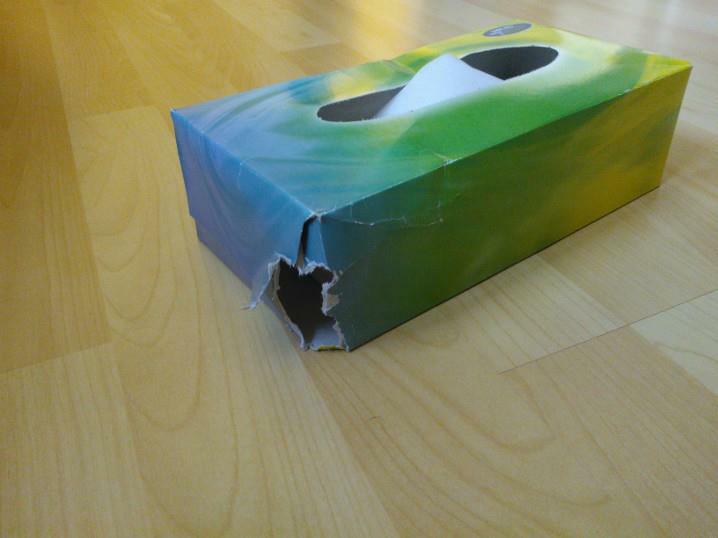 Apparently, the tissues are in a box for a reason. Whatever. I’m still having trouble with the flimsier mediums, though. 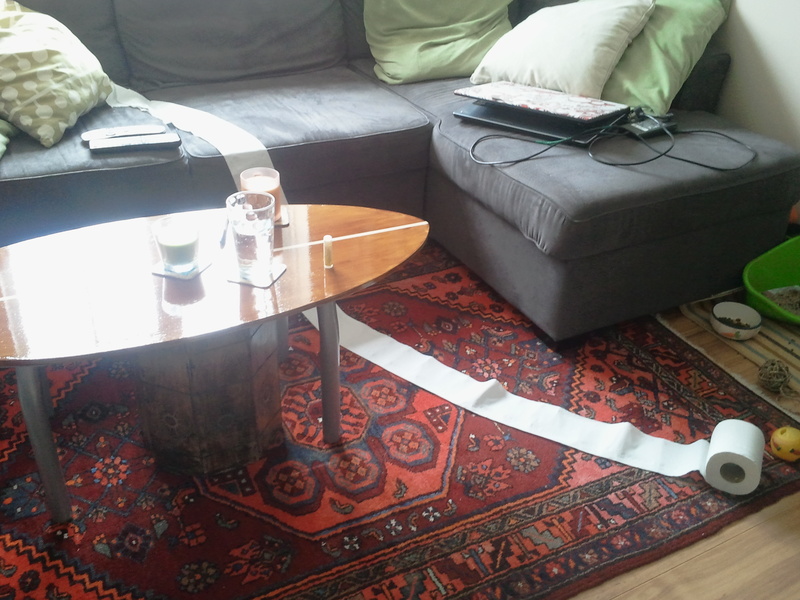 The kitchen roll was a bit of a challenge, but I’m determined to master it. I just keep focussing on my puppy – that’s who I’m doing this for. If you’re at all interested in taking up my services, please leave your details in the comments box, or send me a message on Facebook. No job too big or small! I knocked my piggy bank over this morning, as I do from time to time; I like to hear the coins rattle and guess how much I’ve got in there. Upsettingly, and worryingly, silence fell along with the piggy. It was empty. My first thought was, obviously, that I’d been robbed so I reported it to my mummies and said we should go and tell the policeman who lives next door and see what we ought to do next. They calmed me down and explained that there was no robbery. In fact, they were the ones who had taken my money. I was very upset, as you can imagine. I mean, as a bunny I have zero income and no way of generating one so I rely on the pocket money they give me to buy myself treats and buy my extended family apology gifts when I (accidentally) destroy things. Apparently, herein lies the problem. They sat me down and showed me a list of things they’ve had to replace since my arrival a little under 2 years ago. Now, I couldn’t possibly remember all of them and I wouldn’t bore you with the whole lot, but the edited highlights include 2 laptop chargers, 2 DS chargers (one of which belonged to my Nanna), 2 phone chargers, a pair of Diesel Jeans and an Abercrombie & Fitch hoody (apparently, it’s slightly less serious if I nibble clothes that say H&M on them, although it’s still frowned upon), a cushion cover, a Fender guitar strap, the Guitar Hero drum kit pedal (I thought I was doing them a favour, that stuff’s supposed to be wireless)… Well, needless to say, there’s been a lot of stuff. A sample of my work. The 4th piece is still at large. My Grandad on my German side is an electrician so the last time he was over he fixed the drum kit and one of the phone chargers (which I subsequently got angry with and bit into 4 separate pieces) and showed Mummy J how to repair the wires that I’ve chewed, which has saved them a bit of cash lately, but that doesn’t help with the clothes… Anyway, the long and short of it is that my mummies have said enough is enough and I have to start paying my dues. I managed to haggle a bit and negotiate something of a deal; I’ve only had to stump up for half of the soldering iron since they would have needed one now anyway to do the wiring in their guitars, so I’m only £246.23 in debt after taking that into consideration. Phew. I won’t expect many deposits in my piggy bank for a little while though.